Chelsea get their Premier League campaign underway with a trip to face Huddersfield in Maurizio Sarri’s first league game in charge. 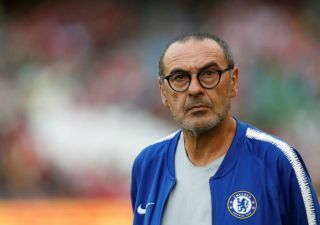 The Italian tactician replaced Antonio Conte at the helm at Stamford Bridge last month, and he’ll undoubtedly be desperate to make a positive start to his tenure. In order to do that, summer signings Kepa Arrizabalaga and Jorginho take their place in the starting line-up to make their competitive debuts for the club, with the former now expected to fill the void left behind by Thibaut Courtois after his move to Real Madrid. As for Jorginho, having been such a fundamental figure for Napoli during Sarri’s reign at the San Paolo, the Italian international will be expected to dictate the game for the Blues this season and he’ll want to put in a positive display first up. Sarri has gone with a strong line-up as expected, but Eden Hazard starts on the bench having returned late for pre-season training due to being given additional time off following his World Cup exploits earlier this summer. With an attack including the likes of Alvaro Morata, Willian and Pedro though, Chelsea will be hopeful that they can take three points back to west London this weekend.